Montessori with your 30 month old to 33 month old is such an exciting new phase of toddlerhood! Your child will have many new strengths and interests you will be able to really start putting their concentration skills to use. There are lots of new materials, activities and environments you can expose your toddler to around this age and you will really be able to see your toddler’s hard work paying off! Click here to check out Montessori for 27-30 months. As a reminder, these activities and material suggestions are just starting points. Don’t expect your child to be able to do all of these things on the first try. This is just an age-appropriate time to begin working on mastering these suggested activities. 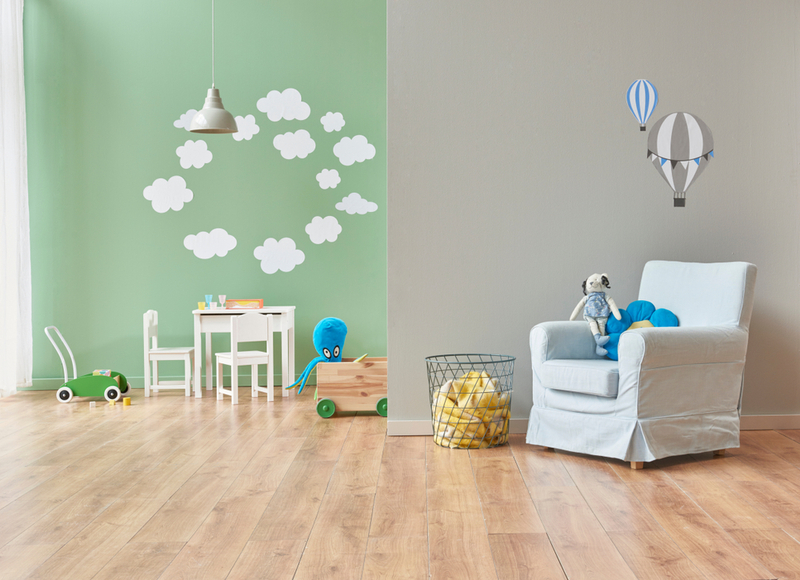 Preparing your environment should be your first step when creating a Montessori home. Providing a distraction free space for your child to grow and learn is the easiest way to get started with Montessori. Building concentration skills, independence and confidence along the way. You can start preparing your home environment with child sized materials and practical life stations. If you haven’t yet created some practical life stations throughout your home this is the perfect time to do so. For instance a self-care station in the bathroom, wooden stool by their dressing area, or a self-serve station in the kitchen. You can also read more about preparing your home environment by clicking here. Montessori materials support a number of different development stages. Your 30-33 month old is probably looking for new challenges and depending on their interests (numbers, colors, letters, outdoors, practical life, etc.) you can provide Montessori materials to help facilitate their love of learning. 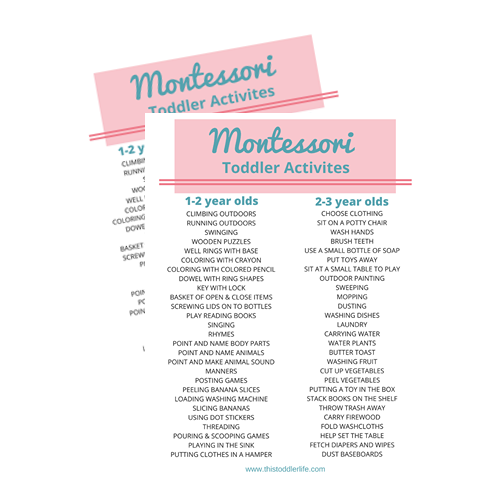 Montessori activities are great when we follow our child’s lead. Do your best to give your child the activities that are compatible to their developmental stage, sensitive periods and interests. If you’re just getting started with Montessori remember that your child won’t always be able to understand something on the first try. It may take days or weeks for your child to comprehend the activity. If you think your child is getting frustrated because of the difficulty level just put the activity away for a few weeks and try again later. Practical life activities are some of the easiest for you to supply yet the most rewarding activities for your toddler. These are skills that will stay with them throughout their childhood and into their adult life. By now your 30-33 month old should know quite a few practical life skills well enough to complete on their own. As your child grows older they will be looking for new challenges in all areas of their life, including practical life. Maria Montessori identifies sensitive periods in development as the child’s absorbent mind (age 0 – 6 years). Follow your child’s lead for their cues of sensitive periods beginning. Try not to underestimate your child’s ability or work. If they are doing certain work over and over, they are probably in their sensitive period for that work/task. Learn more about sensitive periods and how they affect your child by clicking here. Remember that each child is unique and these sensitive periods do not ALWAYS happen between the time frames given. Some children go through them earlier and some later. Follow your child’s lead. Ready to take the next step into Montessori living? Join us in The Montessori Learning Center to learn everything you need to know about Montessori with your 30 month old! Click the image below to learn more. What questions do you have about Montessori with your 30 month old? Leave a comment below! Disclaimer: This isn’t the end all be all for Montessori with your 30 month old. Montessori is largely based on following your child’s lead, knowing that every child is unique, there can not be one set standard for every child. Use this information as it suits your child. Any suggestion on activites for my (very movement driven) 30 months old boy, that would help strech his attention span? I may have missed why, but why the “leaf washing?” And how would you go about this? Leaf washing is a great way for children to take care of something in the home. It also helps them feel like a part of your family community by having a “job” to do. You can easily do this with a small sponge and water or if your toddler is a little younger you can just use a dusting cloth to dust them off until they master being gentle then move to using a sponge with water. You will have to let us know how it goes!